An unknown beast prefers the taste of human flesh, killing over 100 villagers in the South of France. Tens of thousands of citizens scoured the forests and country side looking for the beast out of fear that they could be it's next meal, but with no success. The Beast of Gévaudan made a recent appearance in French movie Brotherhood of the Wolf, generating a new interest in the 250-year-old tale. The beast appeared as the ominous offspring of a lion, supplemented with armor and spiked facial implants. What (or who) is behind these tales of terror and mutilation in 18th Century France? An examination of period lore is interesting and questionable at best, but a University of North Carolina Professor turned an academic eye to the origin and makeup of the beast in a recent academic text. The top image is an artist's rendition of a creature, fitting parts of the description of the Beast of Gévaudan. The Beast is a quadruped about the size of a horse. It reminds witnesses of a bear, hyena, wolf and panther all at once. It has a long wolf-like or pig-like snout, lined with large teeth. [...] The tail somewhat resembles the long tail of a panther, but it is so thick and strong that the Beast uses it as a weapon, knocking men and animals down with it. The description, in parts, fits for a wolf, hyena, bear, or panther, but the combined details fail to describe a single known creature. The Beast of Gévaudan is suggested by modern cryptozoologists to be a mutated bear, wolf-dog hybrid, or a species of long extinct form of mesonychid. Mesonychids are a group of predatory Paleocene mammals featuring a skull similar to a hyena's, but a body about the size of a horse. 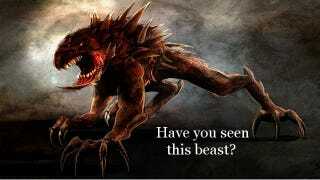 This would place the Beast of Gévaudan in the realm of the Loch Ness Monster – a time displaced, but real creature. King Louis XV (whose poor choices laid the groundwork for the French revolution) quickly sent professional hunters into the woods of Gévaudan to track down the beast. That's a bit like President Obama sending out Seal Team Six to go after the Mothman. Louis XV also rewarded survivors of attacks, including a group of 8 to 14 year old children who fought off the beast with iron tipped spears. Hunters devised a series of weapons to defeat the beast, including a maniacal weapon of beast destruction featuring 30 shotguns tied to 30 ropes, with the ropes tied to a six month old calf set as bait for the beast. Poor calf. Jean-Baptiste Duhamel, a dragoon captain stationed near Gévaudan, mustered up a force of 20,000 plus citizens to search for the beast, with no success. Duhamel communicated closely with Courrier d'Avignon, the only newspaper in the area, exacerbating fear of the creature and circulating renditions of the beast in print. François Antoine, the royal gun bearer, succeeded in tracking down and killing a creature in 1775, returning the six foot lupine for display in Versailles. Despite Antoine's success, attacks continued, disgracing Louis XV and French forces. A second kill is attributed to Jean Chastel, a local hunter, in 1767. The beast's stomach contained the rotten remains of a human. The legend of Chastel grew to play a vital role in werewolf mythology, with French novelist Abel Chevalley suggesting Chastel used a silver bullet to make the kill. Folklore surrounding the Beast of Gévaudan became tarnished when multiple creatures met death while attacks on humans continued. Jay M. Smith, a Professor of History at the University of North Carolina at Chapel Hill, pointed an academic eye at the tale in Monsters of the Gévaudan. Dr. Smith suggests that Jean-Baptiste Duhamel played a large role in stirring up fear surrounding the beast, with Duhamel calling the Beast of Gévaudan a sign of God's anger with the people of France. Duhamel's reasoning for sensationalizing the beast stems from a desire to recoup honor from numerous defeats during the the Seven Years' War. Professor Smith concludes that the Beast of Gévaudan is not a single creature, but a name given to a collection of wolves in the area. Images courtesy of Harvard University Press, CC sources, Universal Pictures, and the Bibliothèque Nationale de France. Sources linked within the article.